Einstein was right: everything is relative. I used to think these things about Piper, that is until I saw a picture my friend posted on facebook (right). 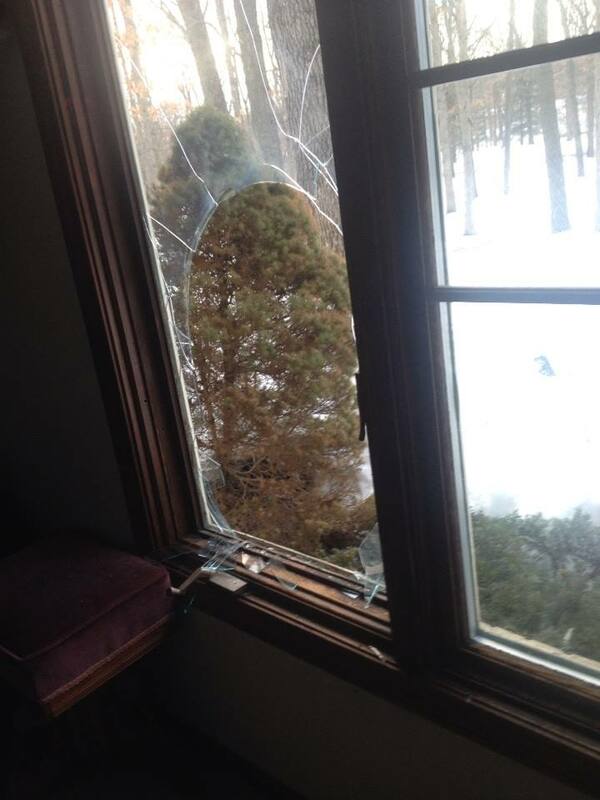 My friend’s dog saw a squirrel outside, and knowing the shortest distance between two points is a straight line, bolted right through the window to catch his quarry. Instead of getting the squirrel he got 9 stiches in his nose. After seeing this picture I thought to myself, Piper isn’t so bad after all. Because, of course, the badness of dogs is relative. Everything is relative if you think about it. You might be 6’2, but you still won’t feel tall standing next to Shaq. You might consider yourself fast, but not when racing Usain Bolt. You might think you’re rich, but not when walking in Bill Gate’s neighborhood. On the other hand, you might think you’re poor, but probably not when visiting a developing nation. It’s all relative. I think this is why New Testament authors constantly remind early Christians to keep their eyes on Jesus. We humans have the tendency to complain—this happens when you compare yourself with someone on the more “desirable” end of the spectrum; when you see that you’re not as popular as _____________, or as well paid as ______________, or as talented as _____________, or as clearly understood as ______________. Poisons such as jealousy, envy, gossip, scorn, discontentment, and dissatisfaction all bubble up from this toxic spring of comparison. But, in reminding believers of Jesus’ own experiences, the Apostle Paul points us all the way to the other end of the spectrum. Look at Jesus, he says. You might want to complain about the crappy day you’re having, but when you run into a friend whose house recently burned down, you’d feel pretty stupid grumbling about a broken dishwasher. Likewise, any unfair, or difficult, or upsetting situation I find myself in quickly seems more than bearable in comparison with all that Jesus endured on my behalf. I often catch myself saying things like, “But that’s not fair!” “I don’t deserve this!” “This is ridiculous!” Even in marriage I am often all too concerned with what I think is “fair.” “I did the dishes last night, it’s your turn.” “You want me to run to Sam’s Club? I was at work all day!” etc. And yet, my logic becomes embarrassing and laughable when I consider Jesus surrendering his rights—all that he really did deserve—to pursue a cross on our behalf. What complaints slipped from his lips as he surrendered to the Father’s will? Did he so much as grumble as He set his face toward Jerusalem? Or as he was mocked and spat upon? Or as he was brutally murdered in the greatest act of injustice the world has ever seen? And here I am complaining…about Sam’s Club? The purpose of looking to Jesus’ suffering isn’t so that you feel like a horrible person whenever you want to complain. Nor is it the purpose to trivialize the truly difficult and sorrowful things going on in our lives—not at all. The point is to understand the depth of Christ’s selfless character and to be shaped by His good heart, remembering that we’ve actually been given more than we deserve. Do this, son, and instead of being filled with jealousy or discontentment you will come alive with gratitude, joy, and a deeper love for Christ. This entry was tagged christianity, complaining, contentment, dog, dogs, faith, happiness, Jesus, sacrafice. Bookmark the permalink. Thanks, Lis, you rock. I appreciate the encouragement so much! I’m really glad you’re enjoying it.